Visit our solo exhibition of works by Rita Kernn-Larsen, who together with Wilhelm Freddie, played a major breakthrough when Surrealism reared its head. 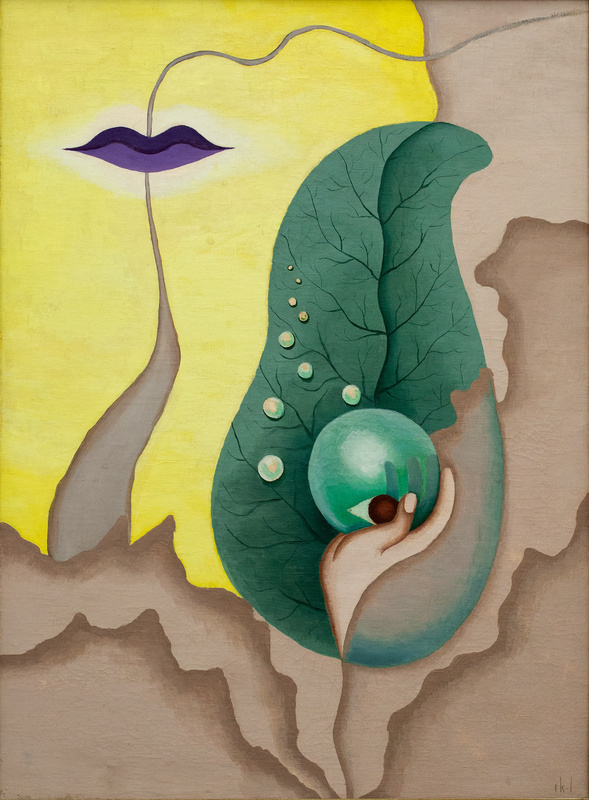 In spring 2019, Kunsten is presenting the first solo exhibition in many years of works by the Danish Surrealist, Rita Kernn-Larsen (1904-1998). Throughout the 1930s, like few other contemporary female artists, Rita Kernn-Larsen achieved great international recognition in intellectual and artistic circles. On the occasion of her debut in 1934, one critic even referred to her as “a female, Danish Picasso.” Despite that praise, however, in our age she has never met with the consideration she deserves. SOLO: Rita Kernn-Larsen explores not only Rita Kernn-Larsen’s surrealistic heyday in the 1930s, but also the later period of her artistic work, which has received little attention over the years. The exhibition features works from throughout Kernn-Larsen’s artistic career: from the compelling, dreamlike scenarios and mysterious characters of the 1930s to the naturalistic landscapes, quirky collages and ceramic works of her later years. To shed some contemporary light on Rita Kernn-Larsen’s oeuvre, Kunsten has invited the Danish contemporary artist, Kirstine Roepstorf (b. 1972) to curate the exhibition. Most recently, Roepstorff made her mark at the Venice Biennale, where she represented Denmark in 2017. On the basis of Kernn-Larsen’s artistic universe, Kirstine Roepstorff will create a contemporary, vibrant and sensuous encounter with the works in the exhibition. The exhibition is a collaboration with Gl. Holtegaard. Rita Kernn-Larsen is an international one-of-a-kind in Danish art. Her early artistic work was devoted to Surrealism together with the Danish confederation of artists, Linien in Copenhagen. However, she never achieved widespread recognition in Denmark. Meanwhile she made a huge impact in France and England, and it was here that Rita Kernn-Larsen would exhibit, live and work for most of her life. In Paris she won international acclaim at an early stage in her career, showing works in some of the most fêted Surrealist exhibitions of the age alongside the likes of Salvador Dali, Max Ernst and Meret Oppenheim. However, World War II was to put an abrupt stop to Kernn-Larsen’s Surrealist work, and she was compelled to find her feet again as an artist. The dreamlike scenes now turned into more naturalistic representations of the landscape in the southern French region around St Jeannet, where she lived from then on. From here she sought out new approaches to her artistic practice, and works from this period will also feature in the exhibition, SOLO: Rita Kernn-Larsen. *All texts are also translated into English.